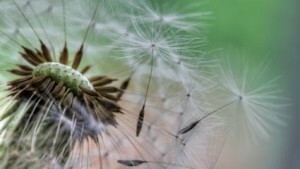 Sowing: The Marvel of Dandelions | Words of Wisdom? Dandelions (Taraxacum officinale) are weeds, as we all know. They are the nemesis of many a gardener, as well as those who attempt to cultivate vast, pristine lawns. But they are also beneficial, providing food for honeybees, and unique nutritional and medicinal benefit for us (should we choose to partake of their hearty, bitter flavor). And they are a brilliant example of nature’s engineering genius. Dandelions grow virtually worldwide, they spread under more adverse conditions than most other plants, and are more difficult to exterminate. Dandelion seeds are a marvel! Not only can they germinate without long periods of dormancy (in fact, their seeds are ready to germinate as early as a single day after the seed ball develops), but they come naturally equipped with their own “wings” which enable their dispersal – aided by the wind – over very long distances. Dandelion seeds sow themselves. Each of us faces the prospect of change in a different way. Whether it is beginning a new job or career path, facing an illness or period of grief, moving to a new home… When you are on the brink of a change in your life, can you see yourself as a dandelion seed? Ready to fly gently into the unknown? Strong and resilient enough to face possible adverse conditions? Resistant to all efforts by outside forces to thwart your intentions? Trusting that your personal inner parachute will enable you to land softly where the wind takes you? What are the “wings” that allow you to fly into new phases of your life courageously? What aids you on your journey toward growth? Do you find this devotional thoughtful? If so, please consider using the buttons below and sharing it with your friends. This entry was posted in Sowing and tagged courage, growth, seeds, strength. Bookmark the permalink. I started asking myself questions (as I often do) over a game or three of solitaire last night (with actual cards). I do this to relax before I go to bed, especially when I am worried about something. I am currently faced with some decisions to make regarding my mother’s house,which I have inherited since her death in 2011. My dandelion seeds, in essence, are those questions that came to mind last night. At first the thought of even a temporary move into my father and stepmother’s home was out of the question, and I would need to find another place to stay if the condition of my current home becomes unlivable. However, giving it further thought, the fact that my father, stepmother and I are getting along better now than in the past, and that I could find other folks to foster my cats for a bit, this option doesn’t seem so out of reach if I should need it. The dandelion seed, then is how I look at the situation. I admit I am very nervous about coming home after being in Respite at the Peer Center in Cleveland GA this week, to face all this stuff at home again.